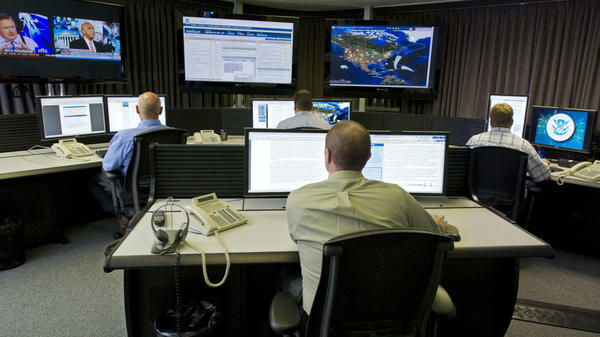 Cybersecurity analysts work in the watch and warning center during the first tour of the government's secretive cyberdefense lab intended to protect the nation's power, water and chemical plants, electrical grid and other facilities on Sept. 29, 2011, in Idaho Falls, Idaho. For the CEOs of companies such as Dell and Hewlett-Packard, talk of cyberweapons and cyberwar could have been abstract. But at a classified security briefing in spring 2010, it suddenly became quite real. "We can turn your computer into a brick," U.S. officials told the startled executives, according to a participant in the meeting. The warning came during a discussion of emerging cyberthreats at a secret session hosted by the office of the Director of National Intelligence and the departments of Defense and Homeland Security, along with Gen. Keith Alexander, head of the U.S. military's Cyber Command. The meeting was part of a public-private partnership dubbed the "Enduring Security Framework" that was launched at the end of 2008. The initiative brings chief executives from top technology and defense companies to Washington, D.C., two or three times a year for classified briefings. The purpose is to share information about the latest developments in cyberwarfare capabilities, highlighting the cyberweapons that could be used against the executives' own companies. "We scare the bejeezus out of them," says one U.S. government participant. The hope is that the executives, who are given a special one-day, top-secret security clearance, will go back to their companies and order steps to deal with the vulnerabilities that have been pointed out. "I personally know of one CEO for whom it was a life-changing experience," says Richard Bejtlich, chief security officer for Mandiant, a cybersecurity firm. "Gen. Alexander sat him down and told him what was going on. This particular CEO, in my opinion, should have known [about the cyberthreats] but did not, and now it has colored everything about the way he thinks about this problem." Among the computer attack tools discussed during the briefings are some of the cyberweapons developed by the National Security Agency and the Cyber Command for use against U.S. adversaries. Military and intelligence officials are normally loath to discuss U.S. offensive cybercapabilities, but the CEOs have been cleared for some information out of a concern that they need to know what's possible in the fast-evolving world of cyberwarfare. Alexander himself hinted at the rationale for the briefings during testimony in March, before the Senate Armed Services Committee. "When we see what our folks are capable of doing, we need to look back and say, 'There are other smart people out there that can do things to this country,' " Alexander said. "We need to look at that and say, 'How are we going to defend [against them]?' "
The fear is that cyberweapons developed by the U.S. military could at some point fall into enemy hands and be turned against a U.S. target. "There are nation-states, to include the United States, who are building cybertools to prevail in a ... disagreement," Mike McConnell, the former U.S. director of national intelligence, said during a recent cybersecurity conference hosted by Bloomberg. "The worry is, what happens when some of those tools, and there are thousands of them, get released inadvertently, or somebody steals [them] to sell to a terrorist group?" The 2010 revelation that U.S. cyberwarriors could turn a computer into a "brick" stemmed from research into a design flaw in U.S. computers, according to several sources. It was determined that an adversary could conceivably update computer firmware — the low-level software that dictates how the hardware works — to make the machine useless. Computer manufacturers had known about the firmware design issue previously, but they had not realized it would be possible for an adversary to exploit the flaw by actually getting into the machine and destroying it. The manufacturers subsequently ordered a reconfiguration of their computers to fix the flaw, and no damage was done. But two participants in the 2010 meeting say the CEOs were sobered by what they learned there. To government and industry officials alike, such incidents underscore the importance of public-private partnership in the effort to address cyberthreats. But the Enduring Security Framework collaboration remains limited to a select few executives, and much threat information remains secret. "That's the policy dilemma," McConnell said during the Bloomberg cybersecurity conference. "How do we establish a regime where that information can be shared with corporate America at the unclassified level in real time?" Proposals to promote greater information sharing between government and industry are a key part of new cybersecurity legislation being considered on Capitol Hill. On MORNING EDITION this week, we're looking at preparations in the United States for a possible cyberattack against key computer networks. Security experts say if an all-out cyberwar broke out today, the U.S. would be vulnerable, and here's one problem: The government knows the most about what weapons might be used, but it is the private sector that's most likely to be targeted. As NPR's Tom Gjelten reports, the two sides need to talk. TOM GJELTEN, BYLINE: Cybersecurity has become an urgent priority, partly because there's a cyberarms race going on right now. The United States, its allies and its adversaries are all developing evermore sophisticated computer weapons. The U.S. military has its own cyber command, headed by Army General Keith Alexander. He knows as much as anyone about the computer weapons being developed on the U.S. side. And at a Senate hearing in March, he guessed other countries are not far behind. GENERAL KEITH ALEXANDER: When we see what our folks are capable of doing, we need to look back and say: There are other smart people out there that can do things to this country. We need to look at that and say: How are we going to defend? GJELTEN: After all, if the U.S. military develops an especially lethal computer weapon, someone else could, too. Here's Mike McConnell, a former U.S. director of national intelligence. MIKE MCCONNELL: There are nation-states, to include the United States, who are building cybertools to prevail on a disagreement. The worry is what happens when some of those tools - and there are thousands of them - get released inadvertently. Or it's - somebody steals it to sell to a terrorist group, somebody who has a different view of the world order and wants to change things. GJELTEN: So, if the people defending U.S. computer networks are to be well-prepared for cyberattacks, it would help if they knew what cyberweapons the U.S. is itself developing, just in case those weapons end up on the enemy side. But cyberwar tools are not something the government generally wants to say much about. Mike McConnell, speaking recently at a cybersecurity conference, pointed out that most of what the U.S. cyber command does in this area is classified top secret. It can't be revealed. MCCONNELL: How do we establish a regime where that information can be shared with corporate America at the unclassified level? GJELTEN: Information first about what cyberweapons U.S. adversaries are developing, but also what might be in the United States' own cyberarsenal, information that could be critical if corporate America is to defend its own computer networks. There is at least one important initiative in this area. It's about four years old, but until now, little has been said about it. It's part of what's called the enduring security framework. Chief executives of top U.S. corporations are brought to Washington two or three times a year for a one-day, classified briefing by General Alexander and other officials. For each session, the CEOs get special, top-secret clearances so they can be told about the latest in cyberweaponry. They can then go back to their companies and take steps to deal with the threats they hear about, threats they may not previously have taken seriously. In the words of one government participant: We scare the bejeezus out of them. Richard Bejtlich, chief security officer at the Mandiant Company, says for one CEO he knows, the Alexander briefing was a life-changing experience. RICHARD BEJTLICH: He got a one-day secret clearance. General Alexander sat him down, told him what was going on. This particular CEO, in my opinion, should have known, but did not, and now it's colored everything about the way he thinks about this problem. GJELTEN: At one session in the spring of 2010, tech company CEOs were told, quote, "We can turn your computer into a brick," unquote. U.S. cyber experts told the execs that they'd learned how an adversary could rewrite computer firmware - the low-level software that dictates how the hardware works - rewrite the firmware so that it would disable the computer. Manufacturers had known in theory about that design flaw, but they had not previously realized an enemy could exploit that flaw in such a way as to actually get into a machine and destroy it. The computer manufacturers subsequently redesigned their machines and fixed the flaw. No damage was done. Still, it was a close call, according to two participants with knowledge of the incident. And there was a lesson. It showed how important it is for the government and industry to work together in addressing cyberthreats. And that principle is now at the heart of cybersecurity legislative proposals under consideration in Congress. Tom Gjelten, NPR News. Transcript provided by NPR, Copyright NPR.